CPAP users sometimes experience fit and comfort issues related to their masks. Mary Breaux of Treater Creek, a natural healthcare products company in Georgia, created this product, CPAP Face Mask Creme, to help her father. Mary is pleased to participate in this opportunity with SleepyHeadCENTRAL to help those with sleep apnea to find more comfort in their therapy. Her creme includes three natural emollients in her proprietary blend: shea butter, vitamin E and coconut oil, which can help to reduce skin irritation where the mask rests on the face and may also improve mask seal. Subscribers to the monthly SleepyHeadCENTRAL.com FREE newsletter qualify to win this wonderful personal resource. Why not subscribe now? Subscription to the once monthly SleepyHeadCENTRAL newsletter is private and free. WHY NOT SUBSCRIBE NOW? If you do, you become automatically entered into the SHC mostly monthly giveaways for fun hand-made sleep products. You receive monthly updates on sleep health news as well. Check out the great items below that we’ve already given away to subscribers! * The winner will be selected randomly from the full subscription list as it exists as of 11:59pm on the last day of every month. One winner picked monthly. Each monthly winner will be contacted through email; winner must reply to email and provide mailing address in order to win. Each winner announced in the next month’s newsletter. We’re all gonna lose an hour of sleep on March 8 when the clock springs forward at 2am for Daylight Saving Time. And March is the month that many sleep-related health awareness events take place. Makes sense that SHC offer subscribers this useful book as a giveaway for people struggling with sleep issues. Sleep Soundly Every Night, Feel Fantastic Every Day: A Doctor’s Guide to Solving Your Sleep Problems by Dr. Robert S. Rosenberg (DO, FCCP) has been in the SHC library of sleep resources for a while now. It’s an approachable, straightforward resource from the medical director of the Sleep Disorders Center of Prescott Valley, AZ and contributing sleep expert at the popular EverydayHealth.com blog. Dr. Rosenberg is passionate about sleep as a critical cornerstone process to good lifelong health. He does a terrific job in this book with helping people to identify potential sleep problems, with solutions that include not only clinical options, but clear-cut lifestyle options that can empower you or your loved one to make changes in your sleep habits and hygiene so you can feel more energetic and reduce stress. Many questions from patients have been answered at the end of each chapter, making this a very useful, focused resource. Subscribers to the monthly SleepyHeadCENTRAL.com FREE newsletter qualify to win this valuable resource. Why not subscribe now? With our January theme all about alternative ways to manage sleep health problems, it makes sense to offer an alternative giveaway related to the challenges of sleep. This gorgeous handmade book, Life After Sleep, by Mark Brand, is only one of a few in the “Hypermodern Edition” series offered by the Chicago Center for Literature and Photography. It’s a special high-quality, signed limited edition handmade book and the story is intriguing. From the website: “It is the day after tomorrow, and a device has been invented that immediately induces REM sleep, otherwise known as ‘Sleep’ with a capital S. Society has been transformed. The average person now only needs two hours of rest a night. The work day is officially sixteen hours long…” Yes, it’s science fiction and it’s great collectible literary art all at the same time, and it could be yours if you subscribe to the SleepyHeadCENTRAL newsletter, a free monthly dispatch. ‘Tis the season for giving, and SHC has two great sleep products from two different artisans to give away to two lucky subscribers. 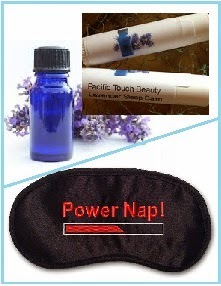 Pacific Touch Beauty offers a two-fer of LAVENDER products: a sleep balm and a pillow mist, both crafted forms of holistic aromatherapy that use the relaxing benefits of lavender to inspire sleep. Balm contains vitamin E, olive oil, lavender oil, lavender buds and shea butter. Mist is pure lavender essential oil. We just received this fun and funky handmade POWER NAP eye mask from Silky Eye Mask and think it could make the perfect stocking stuffer. The red power meter on the bar definitely represents what you are doing while asleep: recharging! Quality embroidery on silk. THE SNUGGLY MONSTER CUFF! It scares away the monsters while you sleep! The cuff offered here is made from limited edition, blue and orange monster fabric! The Way We Sleep [Curbside Splendor Publishing, 2012 || Chicago]. The Way We Sleep is an anthology of short stories, interviews, and comics all dealing with the way we sleep. Beds are the most intimate of places, where you spend a third of your life. They are quiet places, they are rambunctious places. The Way We Sleep combines prose, comics, illustrations and interviews into a fantastic book all about beds and sleep. *Only SHC newsletter subscribers living in the United States can be entered to win SHC’s monthly giveaways.